On a summer's day in 1215 a beleaguered English monarch met a group of disgruntled barons in a meadow by the river Thames named Runnymede. Beset by foreign crisis and domestic rebellion, King John was fast running out of options. On 15 June he reluctantly agreed to fix his regal seal to a document that would change the world. A milestone in the development of constitutional politics and the rule of law, the 'Great Charter' established an Englishman's right to Habeas Corpus and set limits to the exercise of royal power. For the first time a group of subjects had forced an English king to agree to a document that limited his powers by law and protected their rights. 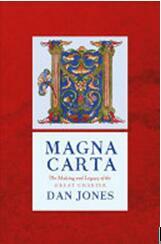 Dan Jones is an award-winning journalist and a pioneer of the resurgence of interest in medieval history. He is the bestselling author of Summer of Blood, The Plantagenetsand The Hollow Crown. He lives in London.